Select Edit>Object effects>Set or use the Ctrl-E keyboard shortcut to acivate the effects window. Turn on the desired effect or effects and manipulate the various settings until satisfied. Note an object may have multiple effects applied to it. The object effects give the user live feedback as each parameter is manipulated meaning the user will see the result in real time. It is therefore anticipated the most common approach to applying an effect will be to simply adjust each setting until the effect "looks right". Once an effect has been set it may be copied with the purpose of pasting it to another template object. Sizeable item designs (NeoPack/Professional, PackBuilder, NeoPack/Plus, OutPost) and Subject Blocks (NeoComposite and CompositeBuilder) are scalable templates.? The user does not enter absolute size when designing these templates as their final size will depend on the layout on which they are being used. The size units for these templates and all objects on them is therefore "abstract". When adding effects to an object on a sizeable template the units are therfore also "abstract". 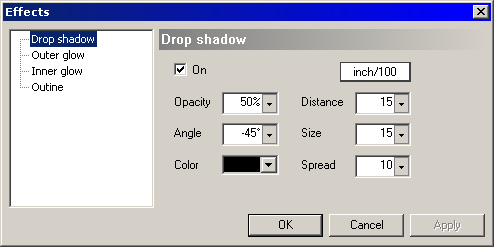 For this reason it may be difficult to gauge the final appearance of the effect when adjusting each effect parameter. In these situations it is recommended the user test the effect on finished product to ensure the effect is as expected.